Bangladesh’s team members Mushfiqur Rahim and Tamim Iqbal, shake hands with India’s captain MS Dhoni and Virat Kohli after their win over India during the first one-day international cricket match between them in Dhaka, Bangladesh. Bangladesh’s players celebrate their win over India during the first one-day international cricket match between them in Dhaka. Bangladesh’s Mustafizur Rahman, left, celebrates with teammate Nasir Hossain, center, the dismissal of India’s Suresh Raina, right, during the first one-day international cricket match between them in Dhaka. Ravindra Jadeja and Suresh Raina run between the wickets during the first one-day international cricket match against Bangladesh in Dhaka, Bangladesh. 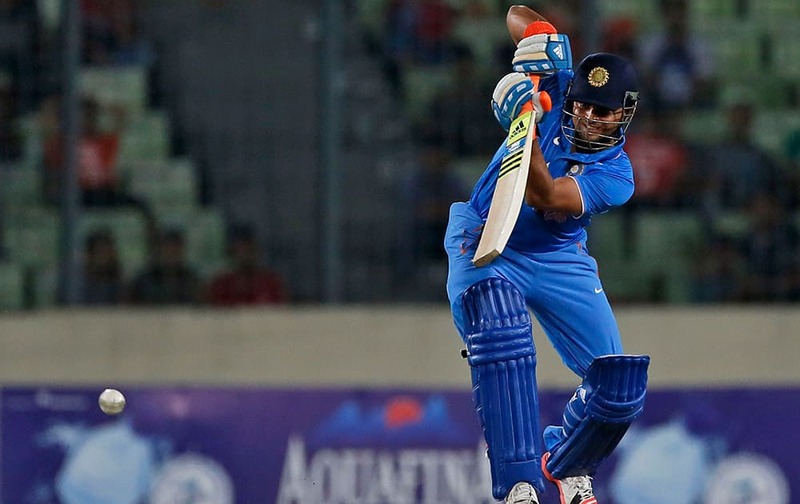 Suresh Raina plays a shot during the first one-day international cricket match against Bangladesh in Dhaka, Bangladesh. Rohit Sharma plays a shot during the first one-day international cricket match against Bangladesh in Dhaka, Bangladesh. Shikhar Dhawan plays a shot during the first one-day international cricket match against Bangladesh in Dhaka, Bangladesh. Mashrafe Mortaza plays a shot during the first one-day international cricket match against India in Dhaka, Bangladesh. 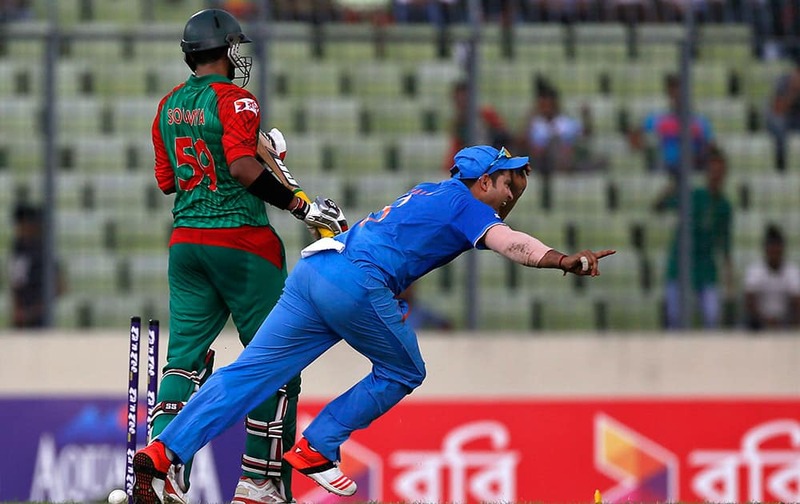 Suresh Raina dives to stop the ball as he fields during the first one-day international cricket match against Bangladesh in Dhaka, Bangladesh. Shakib Al Hasan plays a shot as wicketkeeper MS Dhoni watches during the first one-day international cricket match between them in Dhaka, Bangladesh. Ravichandran Ashwin, celebrate with teammates after the dismissal of Bangladesh’s Litton Das, left, during the first one-day international cricket match between them in Dhaka. 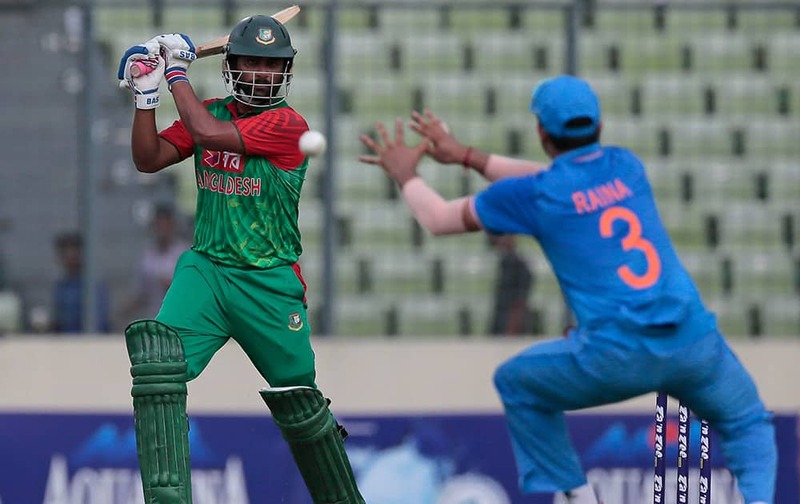 Bangladesh’s Tamim Iqbal, plays a shot, as India’s Suresh Raina attempts to field during their first one-day international cricket match in Dhaka, Bangladesh. 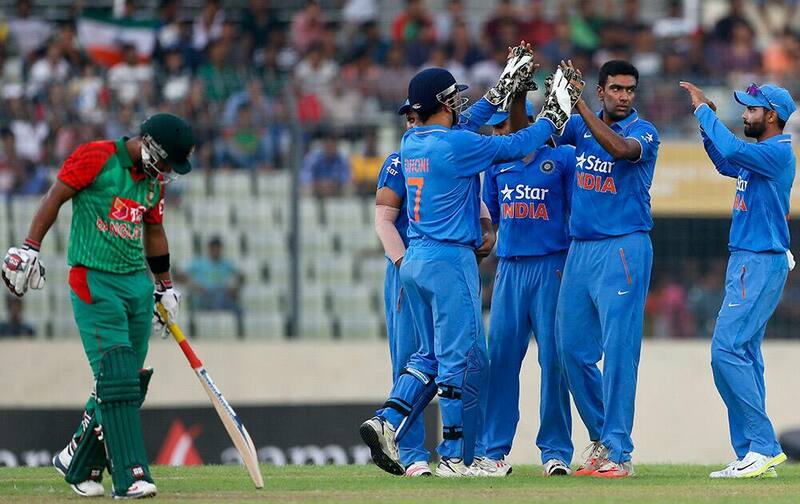 Teammates congratulate India’s Suresh Raina, center, after the dismissal of Bangladesh’s Soumya Sarkar during the first one-day international cricket match in Dhaka, Bangladesh. Bangladesh’s Soumya Sarkar walks back after his dismissal by India’s Suresh Raina during the first one-day international cricket match against India in Dhaka, Bangladesh. 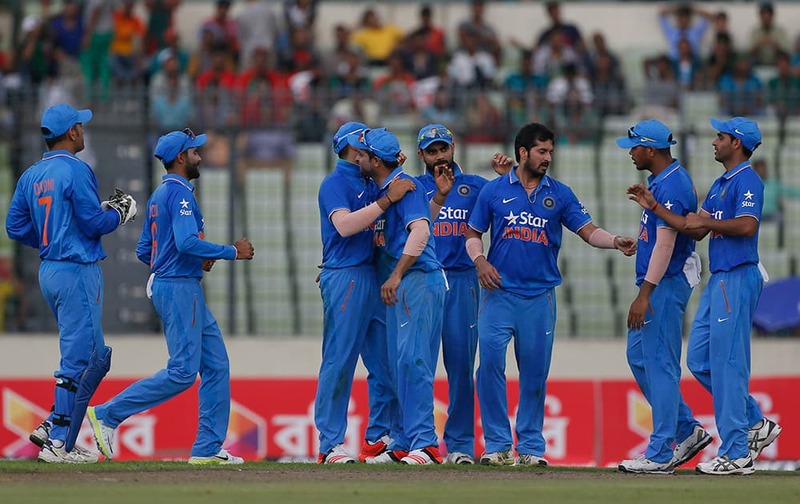 Teammates congratulate India’s Suresh Raina after the dismissal of Bangladesh’s Soumya Sarkar during the first one-day international cricket match in Dhaka, Bangladesh. Bangladesh’s Tamim Iqbal dives to make his ground during the first one-day international cricket match against India in Dhaka, Bangladesh. Bangladesh’s Soumya Sarkar acknowledges the crowd after scoring fifty runs during the first one-day international cricket match against India in Dhaka, Bangladesh. Bangladesh’s Tamim Iqbal and his teammate Soumya Sarkar run between the wickets during the first one-day international cricket match against India in Dhaka, Bangladesh. Bangladesh’s Tamim Iqbal celebrates with his teammate Soumya Sarkar after hitting to the boundary for four runs during the first one-day international cricket match against India in Dhaka, Bangladesh.